The Altar rail is hand-carved. The Lectern, Bishop’s chair, Priest’s chair, and Baptismal font were all donated by Lovely Lane Chapel. The stained glass window’s behind the Altar were made in Philadelphia by the Willet Company. The hand depicts God the Father, the lamb depicts God the Son, and the dove depicts the Holy Spirit. The candlesticks on the Altar were brought from England in 1858. The bell was installed in the 1980’s and is from the WWII Liberty Ship Henry Wynkoop. The reed organ was built circa 1900 and installed at Christ Church, Frederica in 1933. The original hand pump is still intact and the pipes are merely decorative. For years, the windows in the Church were translucent, jalousie-panel glass. Ten new stained glass windows were designed in 2000 by M.B. Keys, a parishioner of Christ Church Frederica, and made by the Wippell Company of Exeter, England. The Rt. Rev. Henry I. Louttit, Bishop of Georgia, blessed the new windows April 29, 2001. Morning Prayer is held daily at 8:00 am (except Sundays) and Holy Eucharist is celebrated at 5:30 pm on Saturday and 5:00 pm on Sunday. Directions: From the gateway at the entrance of St. Simons Island, turn right on Demere Road and continue east on Demere Road 1 mile. St. Ignatius Chapel will be on your left. Villa de Suenos, “House of Dreams”, is ocean-front living at its very best. 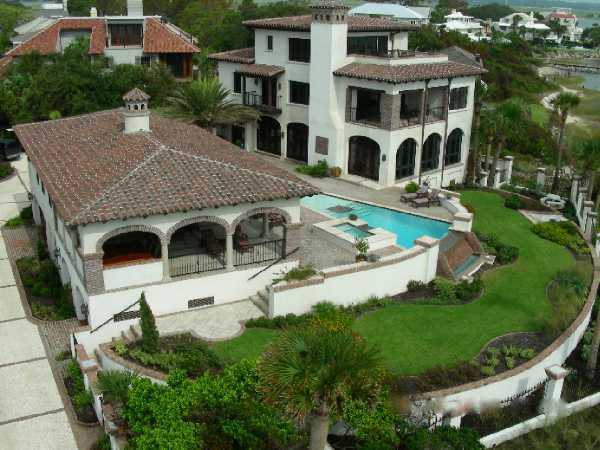 This new Spanish-style villa sits on a promontory point at the end of Bruce Drive overlooking Gould’s Inlet and the Atlantic Ocean. Keith Summerour was the architect for this dramatic home inspired by a 15th century Castillo located in Ejica, Spain owned by the Cardenas family. The owners served as contractors for this unique property. 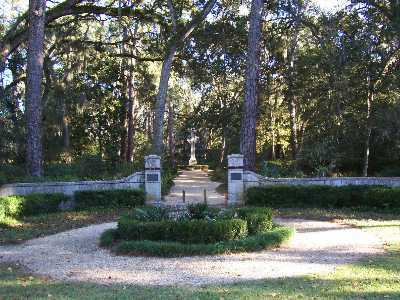 Visitors enter the property through the solid cypress gate on Bruce Drive, which is a door within a gate. Follow the path along the wall to the grand courtyard into a magnificent porte cochere complete with a quatrefoil. This traditional four point design will be repeated throughout the property in fencing, light fixtures, the upper courtyard patio and inside the main house in the entry hall window. As one nears the entrance of the home, the owners’ love of horses is reflected in a horse head fountain; a theme repeated throughout the home. After visiting the guest house, cross the courtyard patio with herringbone brick pattern, quatrefoil gardens and infinity-edged pool with a sun shelf and hot tub that skillfully complement man-made components with the beauty of the natural beach setting. The entrance to the main house is through a large door within a door that was purchased in Spain and was inspirational for the entire house. Note the floors are cast limestone with integrated reclaimed heart pine that was hand stained by the owner. The walls and ceilings are authentic Venetian plaster. Follow the hall that features an old brick vaulted ceiling into the guest room and bath that features a refinished antique vanity with a Mexican pottery basin. A cast stone staircase goes to the second living level of the main house where a Juliet balcony overlooks the courtyard. The master bedroom features a coved plaster ceiling, plaster walls and a fireplace with reclaimed heart pine mantle. The bedroom opens onto a balcony with antique reclaimed Saltillo Mexican tile floors where one can again enjoy the breathtaking vistas of Gould’s inlet and the Atlantic Ocean. Take the stairs to the third floor for another spectacular ocean view on the balcony and see the cypress room that contains a wet bar or party kitchen. Directions: From the gateway at the entrance to St. Simons Island, turn right on Demere Road and continue east on Demere. At the round-about at the intersection of Demere and Frederica Roads, continue onto Demere. Turn left onto East Beach Causeway. After crossing the marsh and Ocean Road, turn left on Bruce Drive. The house is just past the intersection of 16th St. and Bruce Drive. Above all, this is a family home made to be lived in. Designed and built five years ago by the homeowner, the home is centered around the needs of a busy family. Local interior designer Stacey Anderson of Hampton & Hawkins Interior Design, Inc., was the creative force behind the house and designed it from the ground up. The result is a comfortable residence made of traditional old world materials and blended with a coastal flare in a way that takes advantage of its exquisite marsh-front location. The first floor is perfect for entertaining and family activities. The foyer welcomes you first with impressive views and a baby grand piano. The more formal entertaining rooms are full of beautiful and interesting furnishings. Note the shell mirror over the fireplace, bee hive lanterns and soothing colors that provide a retreat from the busy world. Antique furniture pieces with copper sinks are built-in for service in the master bath and similar elements are repeated throughout the home. The second floor features wonderful views of the marsh, perhaps best enjoyed from the upstairs study. There are also rooms for the children on the second floor, with each room meticulously furnished to reflect the child's personality. Back down stairs, the family room combines with a delightful chef's kitchen. Enjoy the detailed doorways, coffered ceilings, comfortable seating and working fireplace in the family room. Knotty oak and limestone floors make for a durable, but dramatic statement. This is the home of a family who love books, and the built-in book shelves are everywhere. The kitchen is large and masterfully outfitted with gourmet appliances, interesting architectural details, and fun accessories. There is a screened porch, with outdoor kitchen and fireplace, as well as a courtyard with a grass and tile checkerboard patio. As you leave, you are going to want to take in every feature of the mud room. There are lockers for each family member, custom-designed storage for the fishing equipment, attention to detail at every turn. Rarely open to the public, Musgrove Plantation is a twentieth century retreat built over several years beginning in 1937 by the historically noted architectural firm of Abreau and Robeson, and is still owned by the family of the original owner. 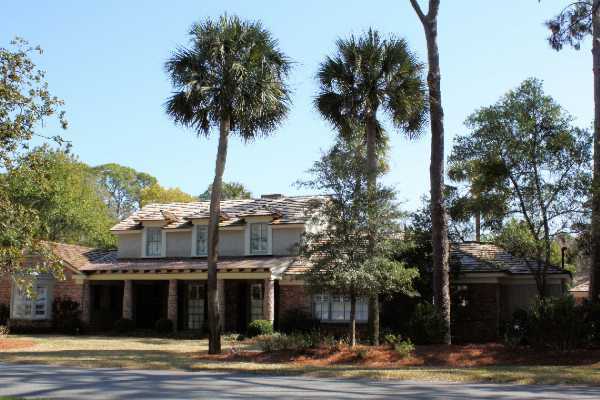 It is comprised of eleven hundred and fifty acres of high ground and protected marsh along beautiful Village Creek, on the east side of St. Simons Island. The Plantation consists of many cabins used as residences by members of the family and their guests. You will see the Grove House, the primary gathering place for meals and relaxation. Typical of all Musgrove buildings, the Grove House is finely crafted with giant cypress ceiling beams and a wall of windows looking out over the river beyond. As you leave, you will walk through extensive, beautifully landscaped gardens. 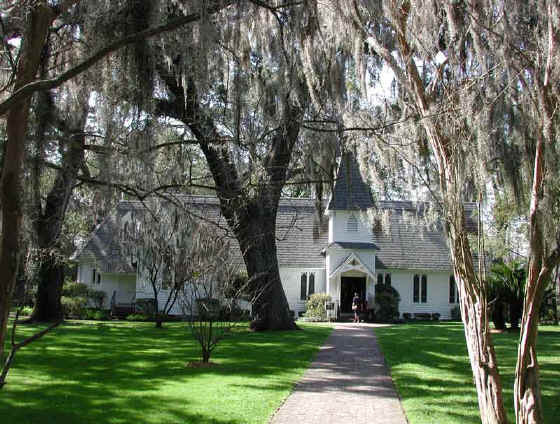 Christ Church had its beginning when General Oglethorpe came to St. Simons Island in 1736 to build the fort and town of Frederica. He brought with the soldiers and settlers, an ordained clergyman of the Church of England, the Reverend Charles Wesley, in order that the colony might have the services of the church from its start. The Board of Trustees ordered a chapel to be built and had three hundred acres of land set aside for the support of the minister and the church. It is on some of that land that Christ Church stands today. The first building in which Divine Services were held was a combination chapel and storehouse built within the town of Frederica. It was well furnished with Bibles, vestments, altar linens, communion vessels, and copies of the Book of Common Prayer, sent by the Society of Propagation of the Gospel, a missionary organization whose purpose was the establishment and maintenance of the Church of England in the Colonies. The Society of Propagation of the Gospel sent the Reverend John Wesley, also an ordained clergyman of the Church of England, to Savannah and, after Charles left Frederica, John came to the island for short visits. However, neither of the brothers was able to adjust his churchmanship to fit the religious needs of the colonists, so both soon returned to England. It was after their return that John had the heart-warming experience at Aldersgate which led to the Wesleyan revival and founding of the Methodist Church. The Society of Propagation of the Gospel continued to send clergymen to Frederica, the last one being the Reverend Bartholomew Zoaberbuhler, who served the entire colony of Georgia from 1743 to 1766. Parish bounds were established during his ministry in 1758. Following the Revolution, the congregations which had been organized and served by clergymen of the Church of England joined together to form the Protestant Episcopal Church of the United States, continuing the use of the Book of Common Prayer with certain minor changes, thus keeping the liturgy inherited from the Church of England almost intact. In 1808, this parish was organized. Warden and vestrymen were elected and incorporated by the Georgia Legislature as the Wardens and Vestry of Christ Church, Frederica. They were granted one hundred acres and three town lots for the building and maintenance of the church, part of the original lands which had been set aside by the Board of Trustees for the colony for religious purposes. The first church was erected on this property in 1820. The rector of Christ Church Frederica, together with the rectors of Christ Church, Savannah, and St. Paul’s, Augusta, organized the primary convention of the Diocese of Georgia. It was to Christ Church, Frederica that the Right Reverent Stephen Elliott, D.D., made his first official visitation as the first Bishop of the Diocese. The parish was served regularly by resident rectors until the Civil War, and the church building was enlarged during that time. But during the War, the building was almost totally destroyed by federal troops. In 1884, the remains of the old church were torn down, and the present building was erected on this site in 1886 by the Reverend Anson Green Phelps Dodge, Jr., in memory of his first wife, Ellen Ada Phelps Dodge. 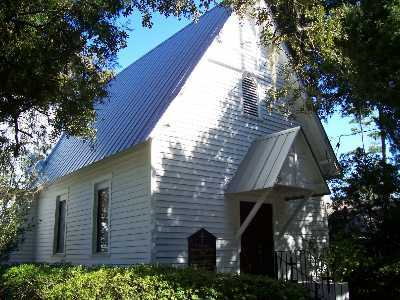 Sunday services are held at Christ Church, Frederica, at 8 am, 9:15 am, and 11:15 am. Weekday evening prayer is held at 5:00 pm daily and Holy Eucharist is celebrated at 11:30 am on Friday. John and Charles Wesley were Church of England priests who accompanied General James Edward Oglethorpe to Georgia in 1735. It was at Frederica, on March 9, 1739, that Charles Wesley entered upon his ministry to Georgians. He also served as a secretary for Indian affairs and as Chaplain to Oglethorpe. 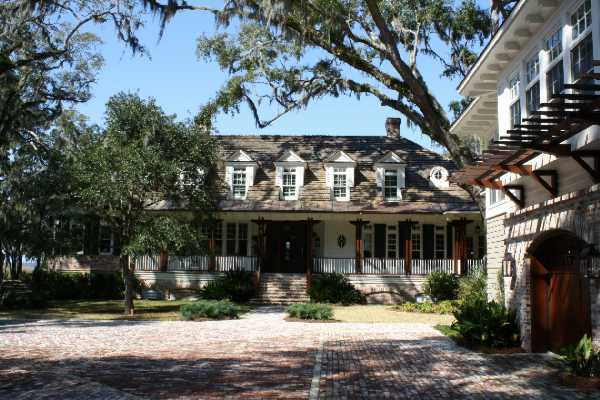 This new Low Country Plantation style home located on the Frederica River was constructed to reflect the owners’ love of and respect for the history of the Georgia Barrier Islands and all things nautical. Designed by architect Jeffrey A. Barnes of Manchester, Vermont and built by Rob Marett Custom Homes of St. Simons Island, the home is situated to take advantage of island breezes while preserving the native plants of the local setting including a large 200 year old oak tree. The owner, who is the principal of Windmere Interiors of Short Hills, NJ, designed the interiors to reflect a unique blend of antiques with family comfort. The dramatic three story entry hall contains three antique flags: a Southern Cross Battle Flag hand made for a reunion of Confederate soldiers in 1895, a 34 star hand-sewn United States flag from the Civil War period, and a 13 Star Swallowtailed Patriotic Banner flag dated for 1890-1900. The dining room to the right is done in blue and white and filled with the owner’s collection of English and Chinese porcelain. The tulipieres and a rare Delft piece are on a small American antique sideboard. The family room contains an extensive nautical Staffordshire collection. The living room area has a collection of nautical paintings, including a William Yorke over the fireplace. On the second floor note the guest room in warm lavenders, the pink granddaughter's room with it's silhouettes and the welcoming soft colors of the master suite. The third level, with it's ships wheel and great view, has a family room, bath and small bedroom. Most of the rooms overlook the vista of the marsh and lap pool. The landscape was designed by Alex Smith Garden Design of Atlanta; landscape and flowers are by Anna Messer English Garden Design of Brunswick. The boat house is a welcoming place to watch dolphins and boats go by. A 29 foot Hinckley is also in residence, giving a true nautical feel to this home. Directions: Take Frederica Road north towards the round-about with Lawrence Road. Travel north on Lawrence road from the round-about. Turn left into Frederica. 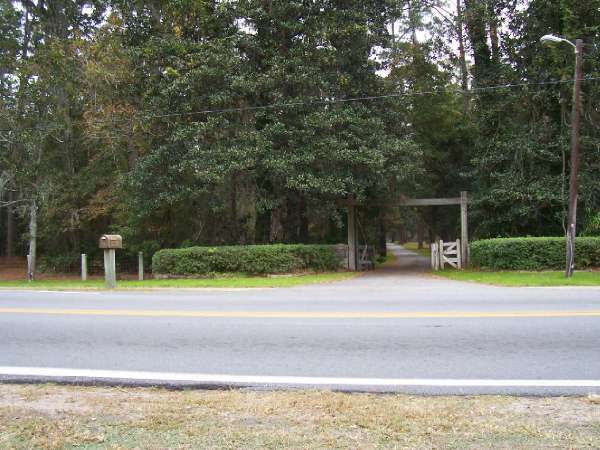 After passing through the Frederica guard gate, go straight on the main entrance road which is Pike’s Bluff Road and follow the traffic signs to the home. This Spanish Colonial home was built in 1930, just two years after the building of the Cloister Hotel. 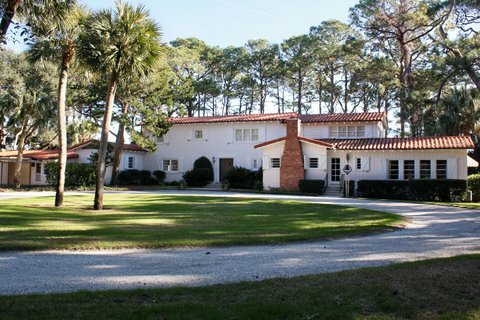 It was designed by Jacksonville architect Francis Abreu, who also designed many other homes on Sea Island, including the nearby home of playwright Eugene O’Neill. The architect did not believe in symmetry and the home is full of wonderful asymmetrical arches and other details. You will enter the home through the front door, which is on the side of the house facing the ocean. Note the Spanish lantern chandeliers, which are of the same design as those in the Spanish Lounge of the Cloister. The fireplace screen features a spider web detail the architect included in all his designs. The architect also believed in north-south ventilation and all the rooms feature a combination of windows and doors that allow fresh sea air to fill the home. There are stucco walls and unique brick-work throughout the house and all the wrought iron is original, with the exception of some on a new porch. There are pewter door-handles, iron railings and sconces, and the backs of some of the sconces were used to make intricate brass light switch plates. Much of the iron work was actually done on the premises and all the building materials were brought over from the mainland on ferries or barges as the home pre-dates the construction of bridges to the mainland. The homeowners have kept true to the original design of the home, always maintaining and preserving the detail in a style kept similar to the original. The home is full of wonderful furnishings and art, much of it purchased with the home when the owners bought it in 1994. The homeowners had rented the house for ten years in the 1970s, so their purchase was a home-coming back to Sea Island for their family. Enjoy the recently renovated yard as you leave, full of beautiful plants and a relaxing pool. There is so much to see in this home, both inside and out, with incredible detail too beautiful and interesting to miss. This home is open and livable, perfect for both family life and entertaining. It was originally built with an asymmetrical colonial façade but the exterior has been recently re-designed and given a complete face-lift by architect Thad Truett. The front exterior now features gas lanterns, triple-hung windows and a porch made of both new and salvaged brick. 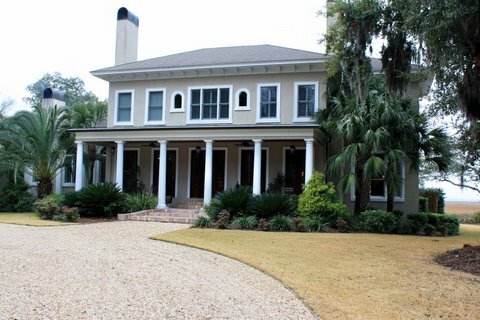 The front columns give the home real character and are made of brick with a classic taper at the top. The cedar shake roof and siding made of tabby and brick combine to give the home loads of curb appeal. As you enter the home, you will first see three bedrooms downstairs and one bedroom upstairs, each decorated with charming fabrics and collectibles. There are built-in bookcases in one bedroom that once went to the floor, but were shortened to accommodate additional beds. Note the restored flooring and new bathroom upstairs, offering plenty of room to accommodate relaxed and happy guests. The home also features a large living room that looks out to a rear porch and pool. The dining room has wonderful built-ins and a collection of china. The kitchen was designed for both cooking and entertaining, and is perfect for a large gathering of family and friends. One of its best features is the view of the meticulously landscaped yard featuring a new pool and spa, summer kitchen, guest house, and back porch. Venture out onto the back porch and admire the heart pine timber columns, tapered much like the brick columns on the front of the house, reclaimed from an old cotton gin. You will love the open flow of this home and the attention to fine detail. 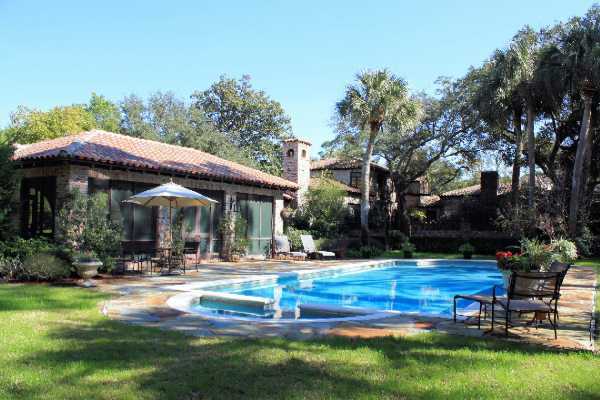 It is a home for entertaining and relaxation, in the best Sea Island style, with plenty of room for family and friends alike. This charming ocean-front cottage just celebrated a major milestone, its 50th anniversary in the family. Built in 1937, the cottage has had just two owners. The original deed from the first owner to the current family hangs in a frame on the wall and the cottage is full of family and Sea Island artifacts. There are seven bedrooms and seven baths in this two-story stucco and wood cottage. The home sits directly on the beach and features walls of over one foot of solid concrete stucco. You will start your tour in the expansive living room featuring wide plank antique pine floors, a beamed ceiling, a brick-hearth fireplace, and comfortable furnishings. All the wood throughout the house, on the walls and on the ceiling, is cypress. Your tour will also take you to a sunroom with a panoramic ocean vista through glass walls on three sides. The broad windows frame a view of the grounds and ocean and provide access to the covered seaside terrace. Off the terrace, there is a “first beach”, perfect for entertaining young children before and after a trip to the big beach just through the pine forest. The views of the ocean are stunning, and privacy is complete as no neighboring houses are visible. As you go up the stairs, note that they are solid blocks of wood. There are three bedrooms upstairs, each with incredible views of the ocean. Note the children’s art that spans several generations. There are more bedrooms downstairs, along with a family room and second kitchen for entertaining. One very unusual feature of this cottage is its two cellars. One was used for storage off the kitchen and the other is off the family room and served as an original, authentic wine cellar. Take time to look at the old pictures, some featuring a celebrity or two, as you enjoy this delightful slice of Sea Island history. 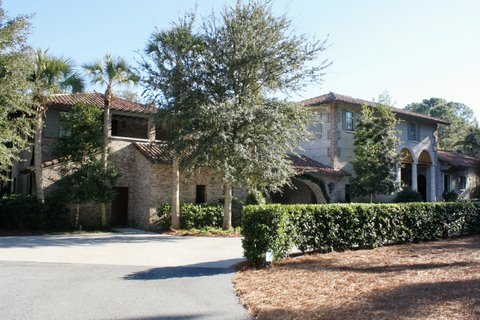 This impressive Spanish influenced home has been thoughtfully designed by architect Keith Summerour to incorporate an arched Mediterranean courtyard providing luxurious privacy, quiet beauty and a dignified example of resort architecture evolving on Sea Island since the 1920s. The exterior is constructed of old Savannah gray brick from North Carolina, the same material used in the remodeled Cloister. Built in 2004, the home is heated and cooled by a state-of-the art geothermal unit. The owners used a blend of family treasures and antiques with locally found pieces to create a pleasing interior, perfect for life on a semi-tropical island. The large painting of a live oak in the foyer is by artist Jim Jones. Chinese items, new and old are found in the foyer and living-dining room. An alcove in the living room accommodates a grand piano that was a wedding gift to the owners. To the right of the living room are two guest bedrooms with baths and a vestibule area containing furniture from the owner’s grandmother. Throughout the home you’ll see ceilings of pecky and clear cypress beams; ceiling beams in the kitchen and keeping room were reclaimed from old textile buildings in Massachusetts and Rhode Island. The kitchen area, designed for complete home entertainment by an owner who loves to cook, includes shelving for cookbooks, wine storage and a real china closet. Upstairs is the master bedroom with ample closets and a fully appointed bath. There is a working home office complete with a balcony to overlook the golf course. Back downstairs, you will go out through the enclosed screened porch past the pool. Off to the left you will pass through the courtyard and enter the guest suite up the steps. A well appointed entertainment area and comfortable living space completes a bedroom and bath with a view off the balcony. You will love the genteel and spacious feel of this home, perfect for entertaining and gracious living.